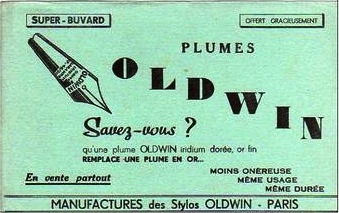 Oldwin is an old french brand which was created by Boris Mora. The brand still exists thanks to his son, André Mora (see page "Links"). This one is a modern cardridge filler made of mottled hard rubber. Note the solid gold clip, the huge nib, the nice thread at the end of the section, and the stepped end of cap and barrel. 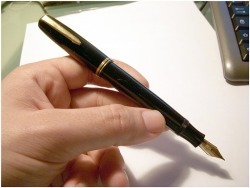 This is a big pen, 14,2 cm closed ! This pen is made artisanaly and a very small number is made in each pattern. You have no chance to have the same pen than your colleague when you use this pen in a meeting ! 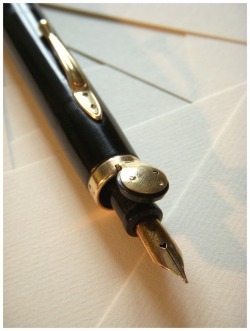 Big fountain pen with white metal clip and rings but solid gold nib. 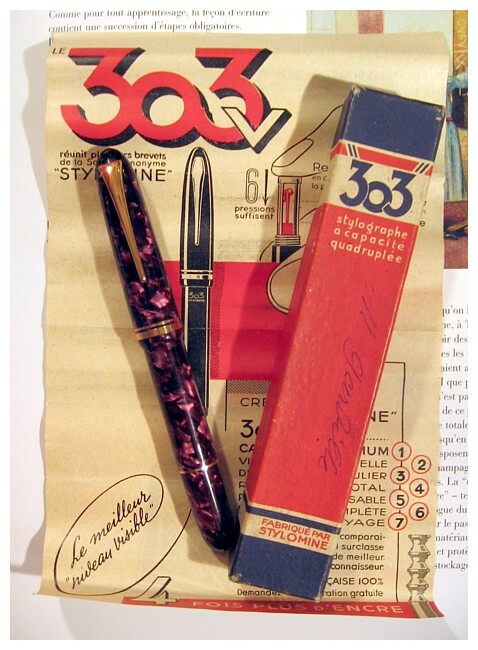 Two Stylomine 303 D. One black and one purple. These are two big French pens, 14 cm long with an accordion sac filling system. The accordeon sac ends with a glass reservoir in a steel cage which allow to see the ink level. 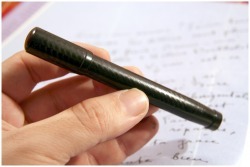 This pen is made of Mottled Hard Rubber. Same filling system than the 303. 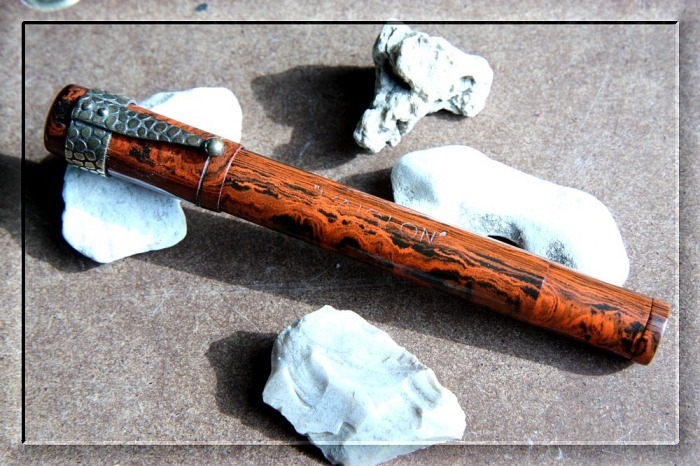 This is a hard to find fat fountain pen. 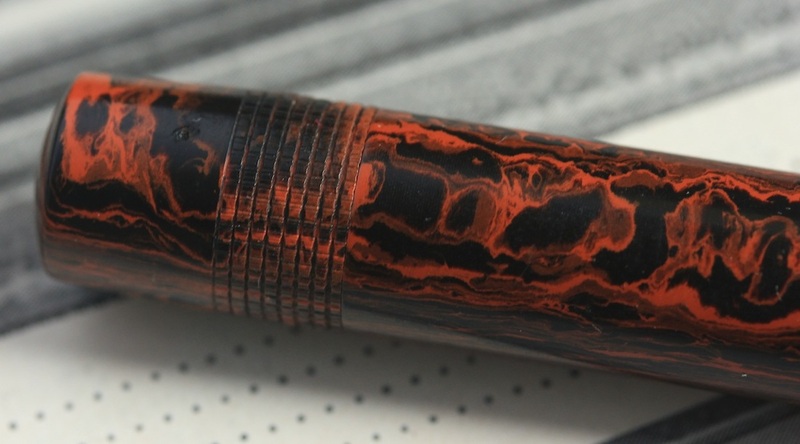 This is a nice fountain pen. Lever filler. The same model exists in a bigger size, with visible ink level, much more difficult to find. Little french Edacoto. Very nice blue striated celluloid. This pen is mint with sticker. Lever filler. Gold filled clip, ring and lever. This is the oversize version of the Edacoto with ink view. A quite difficult french pen to find. 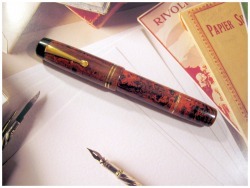 La Plume d'Or was a french fountain pen maker. 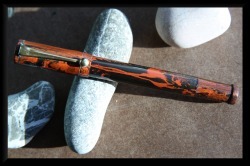 They made very interesting fountain pens including the famous Meteore "Pullman" - see below. 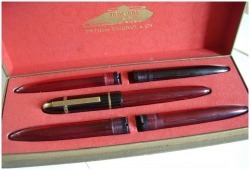 The fountain pen "L. Badois" is also very interesting. 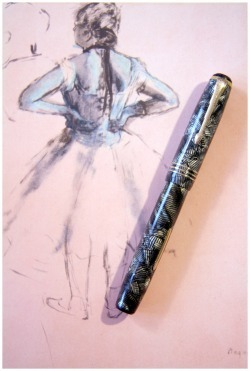 I found this pen in a pen show in Paris in 2013. I didn't know who made this pen, what was the filling system. Never seen before but i found it has an interesting look ! I made some research and found the above advertising. 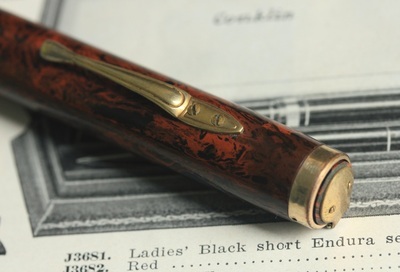 This pen was made by "La Plume d'Or" in 1923. It was a little bit more expensive than the Meteore lever filler and was described as a "scientific victory". 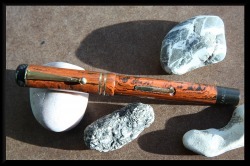 The pen is engraved P.P.R. 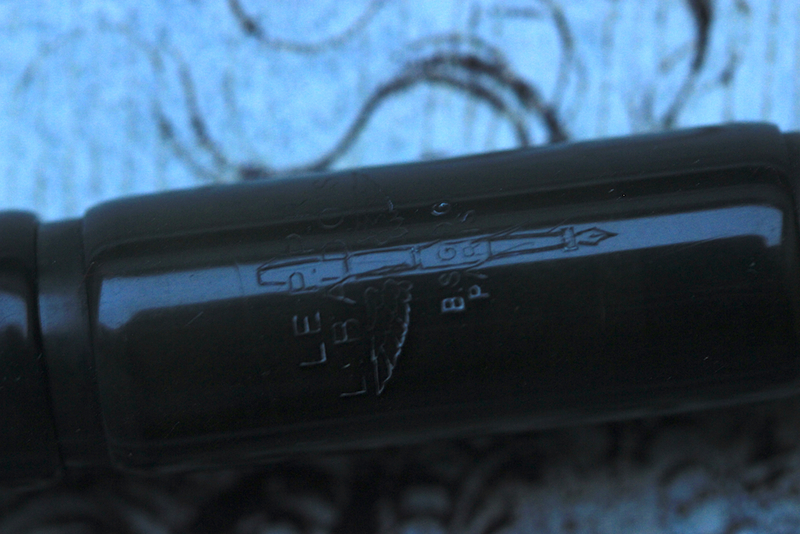 L. Badois which means "Porte Plume Reservoir Louis Badois" (Fountain pen Louis Badois). 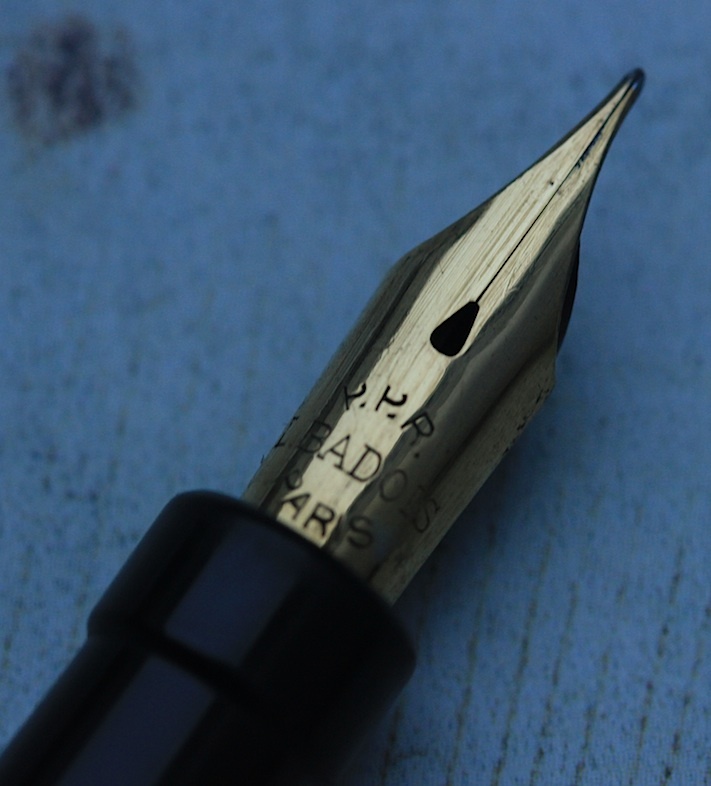 The solid gold nib is really nice and is also engraved P.P.R BADOIS Paris. I also looked for patents. 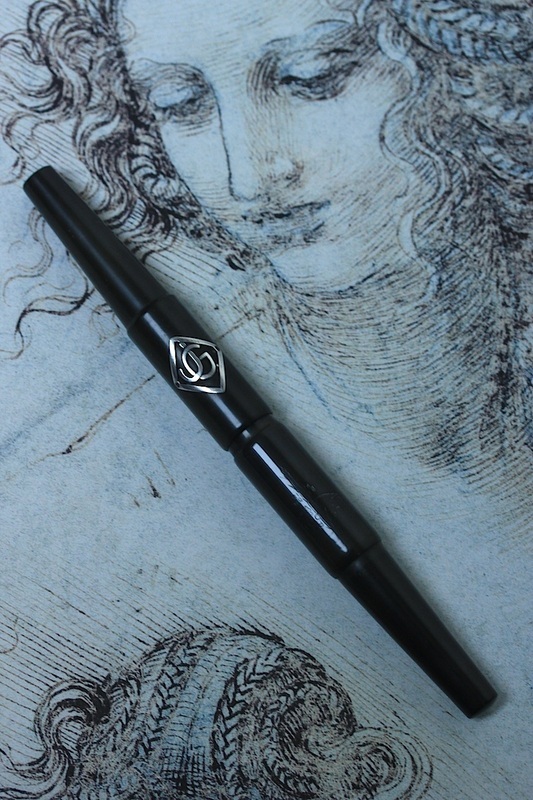 Louis Badois had several patents for a pen with this design but at this time i am still not sure of the filling system. Certainly an extremely rare pen. 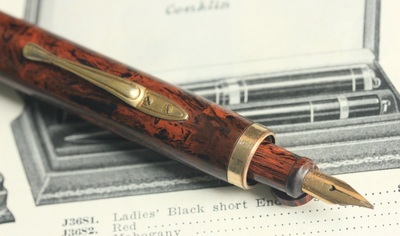 This pen was made by the company "La plume d'or". 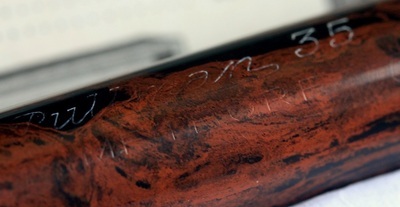 This is a mottled hard rubber fountain pen, lever filler, with a white band at the top of the cap. Safety version. This one is mint and still has his price sticker. The french Meteore Pullman is a very rare and interesting pen. This one is made of black hard rubber. It is a button filler. the nib appears when you push the barrel. The mecanism is quite fragile and can be easily broken. There is a bar fixed on the barrel which push the little cap when you open the pen. This bar is often broken. If you have one, be carefull ! ... better to send it to me than to brake it !!! :-) On this picture the little cap is on the wrong side. It should be under the nib when open. This has been fixed since. 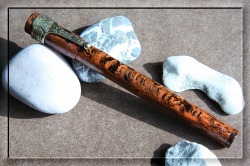 Same pen in mottled hard rubber. Much more difficult to find. 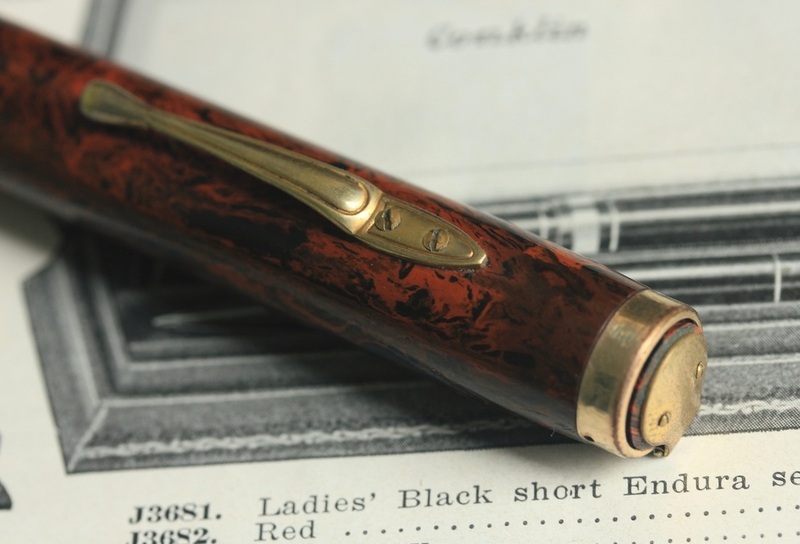 The Pullman was produced in different materials including sterling silver, gold plated overlay, and celluloid. 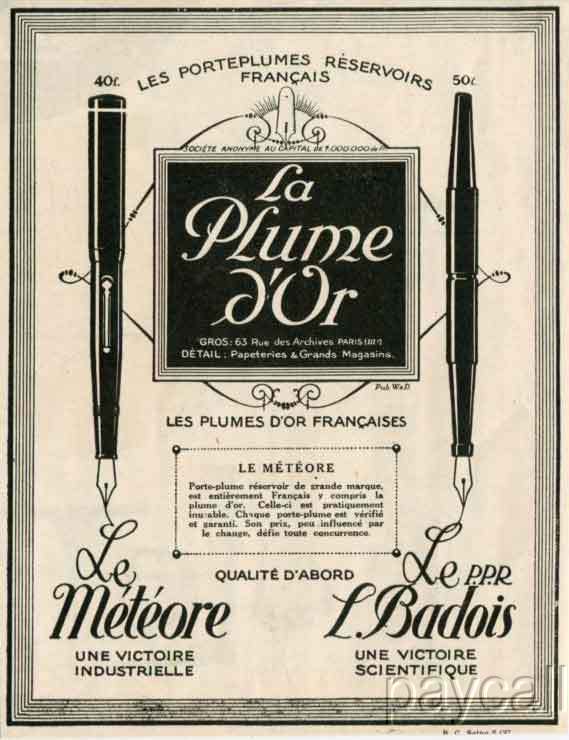 It was produced and sold by the brand "Meteore" in France but similar pens can be found with no name, produced in england. 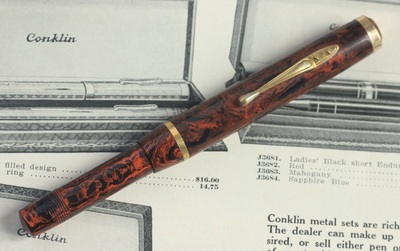 This Gold Starry is one of the first pen of the brand. It is a safety in black hard rubber. It was made in England and imported in France. The french company Gold Starry will appear later in 1921. 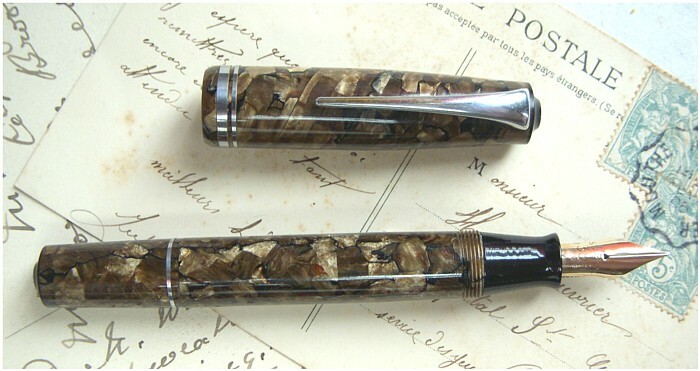 I really like this pen with this very nice clip, the little greek key cap band and this nice mottled hard rubber. 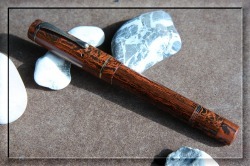 It reminds the Parker duofold Junior streamlined but it is a lever filler. 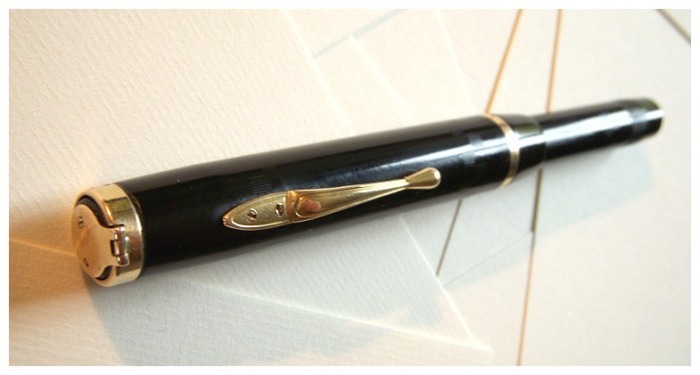 This a very simple but quite nice fountain pen. Button Filler. 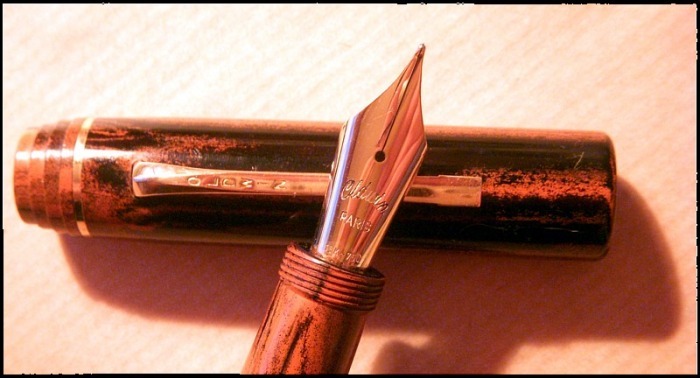 18k gold nib. 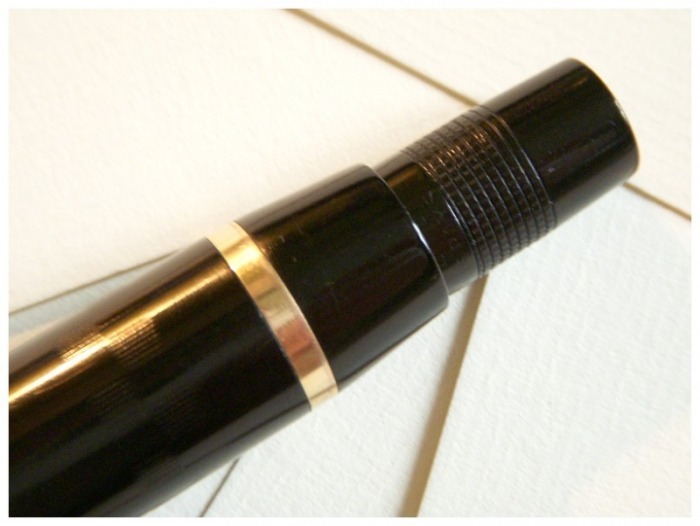 This is an oversize fountain pen. 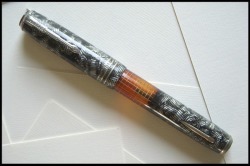 It is an eyedropper filler, the barrel holds the ink and has to be filled with an eyedropper. 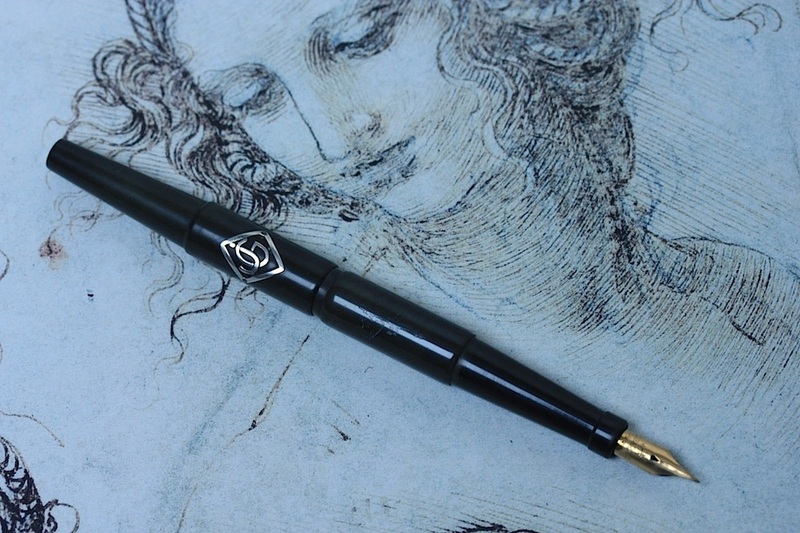 However this pen comes with four extra barrel which are used as travel ink pots. Each barrel is red and has good transparency. This allow to see the level of ink at any time. The TANK also exists in a smaller version (TANK 300), and in other colors of cap or barrels. This is a nice french safety. No name. Look at this very special mottled hard rubber. Nice J.M. Paillard lever filler. Mottled hard rubber. Look at the details around the lever, the chased and round top of cap. This pen has a #2 18k gold nib. 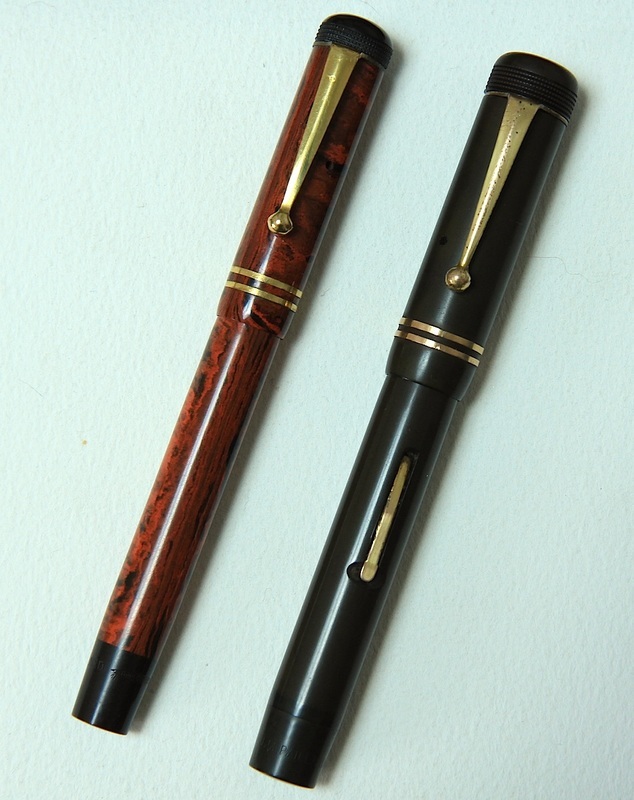 Below, the same pen compared to a rare oversize #6 nib. Another kind of mottled hard rubber. Nice "smiling sun" decorated clip.